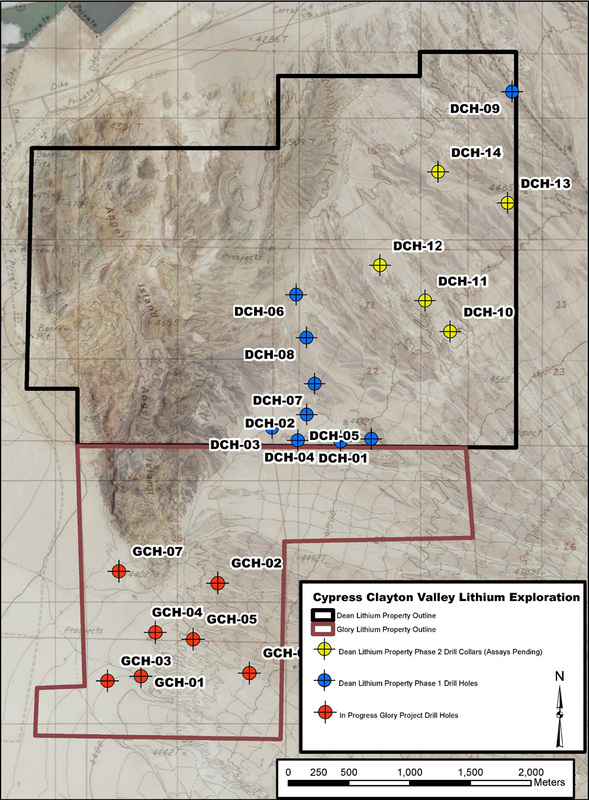 Cypress Drills 121 meters of 1146 ppm Lithium, Expands Mineralized Zone in Clayton Valley, Nevada | Cypress Development Corp.
Vancouver, BC - Cypress Development Corp. (TSX-V: CYP) (OTCBB: CYDVF) (Frankfurt: C1Z1) ("Cypress" or the "Company") is pleased to announce results from two additional core holes, DCH-15 and DCH-16, at the Company’s Clayton Valley, Nevada lithium project. Today’s results include intersections of 126 meters averaging 1068 ppm Li in DCH-15 and 121 meters averaging 1146 ppm Li in DCH-16. The two intersections, located in the southeastern corner of the Dean property, are the best the Company has drilled to date in terms of contained lithium, and are significantly positive results as Cypress closes in on completing work on a maiden resource estimate. The intersection of 126 meters of 1068 ppm Li in DCH-15 is significant in successfully demonstrating continuity of lithium mineralization between drill holes, namely between DCH-10, 510 meters to the northeast, which returned an intersection of 64 meters averaging 1014 ppm Li, and DCH-05 550 meters to the southwest, which returned 80 meters of 1063 ppm Li. DCH-15 and DCH-16 were both extended deeper than most of the previous 14 holes on the Dean property thanks to the experience gained by the driller, Morningstar Drilling of Three Forks, Montana, in coring the soft mudstones. The result was an increase of 50% to 100% in the length of lithium mineralization observed in nearby holes DCH-05 and DCH-10. DCH-16 was drilled 70 meters southeast of DCH-10. The hole was located relatively close to DCH-10 to confirm the mineralization observed in DCH-10, and to also determine if the lithium values might continue to depth. DCH-10 was abandoned at a depth of 64 meters due to difficult drilling conditions, ending in 3 meters of 1048 ppm Li. The intersection of 121 meters of 1146 ppm Li both confirms the values in DCH-10 and clearly was successful in extending the depth of mineralization in this location. Drilling is continuing. One further hole, DCH-17, has been completed on Dean and is pending assays. Another hole, GCH-05, is nearing completion on Glory claims, where at least one additional hole is planned before month end. These results along with the previous drilling on Dean are expected to be incorporated in the Company’s ongoing resource estimate, which is expected to be completed soon after final assays are received.